And I now have the Top 300 Comics sales estimates and the aggregate sales figures for March 2007 online here. My analysis article, along with the trade paperback data, appears at the bottom. A note about this data and timing, as my reports will be handled a little differently than others you may see (and, indeed, differently from what I used to do when I worked for F+W). Diamond releases not only its Top 300 listings, but market share data and other keys from which observers can estimate the size of the market. With the Diamond orders of few comic books alone, anyone can calculate a reasonably accurate estimate of sales figures these days. (It was different before they went to Final Order reports — the variances were much higher — but today, most estimates out there hew pretty close to one another. In the case of my reports, I take an additional step. As you might expect, Diamond generates a complete record of what it sells each month for the major publishers — right down to single copies of trade paperbacks on the Star System — and that information, when applied to the market shares, generates the Overall calculations I've been doing for five years on CBGXtra. Since the timing of that raw information doesn't always synch up with the release of the sales charts, the release of my analysis will vary from month to month, depending on what information has been disseminated. In some months, everything's available and there's very little lag time. Other times, there might be either because of the data being unavailable or scheduling conflicts on my part. So begin checking The Comics Chronicles around the middle of each month for the prior month's data. On some occasions, if I have time, I may be able to get an intermediate report online, with the Overall final analysis to come. Big media events helped propel comics orders for the first quarter of 2007 to a finish 12% over that of the same time last year, according to my analysis of the sales reports released by Diamond Comic Distributors on April 13. The attention surrounding the death of Captain America and the 300 movie helped round out a quarter which in past decades had been a momentum-killer for the business. Overall, the market was actually down slightly year-over-year for March, but it was up in all narrower categories, and the strength of January and February helped boost the quarter overall. Comics unit sales: The Top 300 comic books had retailer orders of slightly over 7 million copies in March, about 4,000 copies more than the total from the same month last year. To date, unit sales for the Top 300 each month add up to 20.3 million copies, up 9% over last year's total of 18.61 million copies. 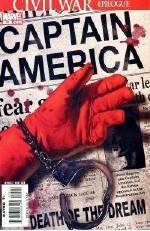 Marvel's Captain America #25 topped the list, and Diamond recorded all versions of the issue together with a total of 290,500 copies. Approximately 193,000 of the copies were the original version, with the Steve Epting cover accounting for the remainder. Not counted in that total are the copies shipped to the United Kingdom market. Comics dollar sales: The Top 300 comic books had sales worth $22.44 million in March. The total is 4% more than last March's total of $21.51 million. more than the same month last year. To date this year, comics dollar sales stand at $64.14 million, up 14% over last year's total of $56.3 million. Trade paperbacks: The Top 100 Trade Paperbacks and graphic novels reported by Diamond had orders worth $4.14 million at full retail in March, an increase of 2% over the same month last year, when the figure was $4.05 million. In the year to date, the Top 100 trades frome each month amount to $11.89 million, up 8% over last year's total of $11.04 million. Dark Horse's 300 hardcover provided an unambiguous case of movie attention helping a comics product. The volume had more than a quarter million dollars worth of orders at full retail and led the list for March. Adding the Top 100 trades to the Top 300 Comics for the month yields $26.58 million, an increase of 9% over the $25.56 million ordered in the same month last year. In the year to date, this category stands at $76.03 million, up 13% over last year's sum of $67.34 million. Exclusive: Diamond’s “overall” sales: In the most inclusive category calculated by anyone in comics, I can estimate Diamond’s total sales for comics and trade paperbacks, including all those not in the Top 300/100 every month. Diamond publishes dollar market shares for its top 20 publishers across all comics, trade paperbacks, and magazines,. Knowing the exact total orders of any publisher on that list right down to the oldest backlist item allows you to calculate Diamond’s total orders across these product groups. The March 2007 total was $33.43 million, which increases to $36.39 million, when Diamond’s estimated United Kingdom orders are added. The figure is down 4% from the $34.8 million ordered in the U.S. in the same month last year. In the year to date, overall sales stand at $99.3 million, up 12% from last year's $36.39 million. The “overall” category overstates comics’ actual performance to the extent that magazines that do not have comics content are included. The comics publishers’ market shares would actually be slightly higher, if ancillary items were removed. Market shares: DC placed 91 comics in the Top 300 in March to Marvel's 86; nonetheless, Marvel came in first in all categories. Marvel's unit and dollar shares of the Top 300 comics each were higher than 50% for the first time in a while. Looking at the overall shares, Marvel's portion drops to the mid-40s. Dark Horse bested Image for third in both comic-book unit sales and in the wider categories, posting its best share performance since the release of the final Star Wars movie in 2005. Price analysis: The average comic book on Diamond’s Top 300 list cost $3.27, up from $3.15 in the same month in 2006. The weighted average price – that is, the cost of the average comic book Diamond sold – was $3.20, up from $3.08 last year. The average price of the comics that made the Top 25 was $3.17.